Last week I was chatting with a young woman who shared with me that her grandmother has Alzheimer's disease. But, she also shared with me that she does not visit her grandmother in the nursing home because she has Alzheimer's. After I recovered from my urge to shake her, it got me started thinking - and this is a common reaction and part of the stigma of Alzheimer's disease that we need to conquer. Visiting a loved one in the middle and late stages of Alzheimer's disease or dementia can often be intimidating and frightening. The nursing home setting can also be frightening, especially for young adults or children. I can understand this young woman's urge to remember her grandmother before this devastating disease took over her mind and body, but as with any loved one facing a serious illness - this is the time they need us the most! Learn about Alzheimer's and dementia and the disease process. This will help you know what to expect, and be able to separate your loved one and the disease. There is a lot of grief when someone you love doesn't recognize you, but knowing this is the disease and not your loved ones heart can provide a little peace. Even if you think your loved one doesn't know you there, they know. Even in the very late stages of the disease a loving touch or holding hands, singing or reading will bring a sense of comfort and love. If your loved one can no longer tell you they love you and need you, it doesn't make those feelings go away. Go slow and take your time asking questions and waiting for responses. The disease disrupts the brain's processes, making response time much slower than yours. Keep visits simple, only bring a few people at a time, and know when your loved one is getting tired. Still feeling anxious? Ask the activities director at the home, they have great ideas and will be willing to help! Or give us a ring, we not only have great activities, but also really great books that will help you talk to your children about Alzheimer's or dementia. Please, go visit this Mother's Day or on a random Wednesday. Many years ago I wish someone would have shaken me, I learned the very hard way that when someone is gone, they are gone forever. I would give everything to have five more minutes with my Pappaw, even if it was in the last few years of his life during his struggle with Parkinson's. I can promise you, whatever it is that is keeping you from making that visit can not be worse than a lifetime of regret for missing the opportunity. Don't miss your chance to catch Caregiver University 2.0! We have a few events left this year, find one near you and register by clicking here! Have your or someone you know been diagnosed with Alzheimer's disease in the past year? Join one of our Living with Alzheimer's groups, more information by clicking here! Please join us in celebrating the immense contributions of Senator Rockefeller to the cause of Alzheimer's disease on May 29 at the Thanks for the Memories Luncheon. This event is one of our largest fundraising events, we hope to see you there! Ticket and table sponsorship here! Join us to celebrate our local authors! We will be celebrating authors, Jennifer Waggener and Susan Young, who were recently published in the new Chicken Soup for the Soul: Living with Alzheimer's and Other Forms of Dementia. This edition of Chicken Soup for the Soul is flying off the shelves, so this is your opportunity to buy a copy, and spend sometime chatting with the authors while - I bet they will even autograph your copy! The event will be held on May 22 at 5:30 p.m. at Taylor Books, more info call 800.272.3900. PANCAKES! Head to IHOP in Morgantown on May 21 from 5 -10 for Dann's Angel's Walk to End Alzheimer's team! Speaking of Walk to End Alzheimer's, have you registered your team? JOIN US! I helped put together a cook off a few months ago, and the gal in charge of the ingredients brought this little jar of love into my life. This company is a true family affair, you can read more about their story, here. 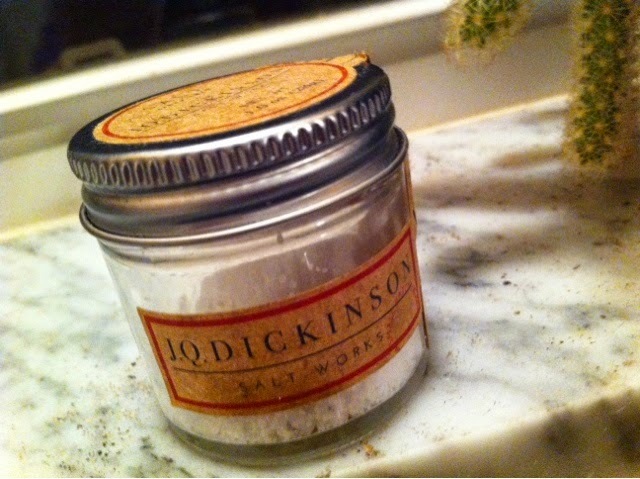 The thing about salt, is the more you use - overtime the more you need, which is not always a great thing. I have never used a lot of salt in my cooking so a little goes along way. Their artisan salt provides the perfect amount of seasoning - a beautiful final touch to any dish! And, it is a West Virginia product made with lots of love! Find where you can buy a little jar of love here!